HAZELWOOD, Ind. -- The sun is just beginning to peek over the horizon, but a crowd has already gathered at Tom Prince's farm. It's an international group; a half-dozen languages echo in Prince's metal-sided barn as a man kneels over a bleating goat and says a brief Muslim prayer, then cuts the animal's throat with a swift slash using a long, sharp knife. It's hard to imagine a more unlikely scene -- in Indiana or just about anywhere else in the U.S. -- than the early morning gatherings that take place here. Since 1999, Prince has operated a self-service slaughterhouse 20 miles west of Indianapolis, specializing in providing goat meat to the area's growing international community. His card reads "You Buy -- You Kill -- You Dress -- You Take Home," and business is booming. The 80-year-old Prince holds court inside the spotless facility from 7 a.m. to 1 p.m. every Friday and Saturday, selling about 50 goats each weekend. In the weeks before Muslim and other religious holidays, sales often double. Prince speaks in a slow Southern drawl. It's decidedly domestic compared to the array of languages spoken by customers who have made their way to Central Indiana from Morocco, Yemen, Nigeria, Eritrea, Togo, Kenya, Pakistan, Mexico and other places around the globe where goat is a dietary staple. "I never thought I'd know so many people from different countries," said Prince, who developed his taste for goat -- often said to taste like a sweet mix of beef and pork -- as a child in rural Tennessee during the Depression. In the past few years, goat meat has become available in a growing number of grocery stores and specialty markets. But Prince's business continues to grow -- even though he doesn't advertise or have a Web site -- thanks to word of mouth. The attraction for many is the freshness of the meat and the low price. Prince sells goats for $1.40 a pound based on their live weight, and a 70-pound goat will provide about 35 pounds of meat -- so the meat costs customers an average of about $2.80 a pound, or $98. For some, butchering their own meat helps maintain a link to cultures they've left behind. Still others, including the large number of Muslims who buy from Prince, prefer to kill and butcher the animals themselves to ensure food preparation standards of their faith are followed. Prince said he doesn't know a lot about Islam, but he is savvy enough as a businessman to make sure his operation meets their needs -- including situating the killing table so it faces east, toward Mecca. Muslim customers like Ahmed Awad, 37, Indianapolis, say they appreciate the nod to their faith. A native of Yemen, Awad has been coming to the slaughterhouse about once a month for the past year to buy meat for his family. "You can buy goat a lot of places," he explained, "but I want to kill it myself." Prince raised and sold goats for years, but he didn't open the slaughterhouse until after he ran into trouble with state and local authorities. 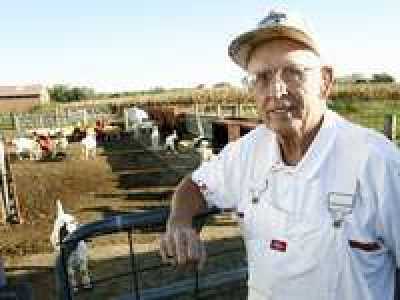 "When I moved out here in 1969, I bought four or five goats just for myself," he said. "Then an African fellow came out and asked me if I'd sell him some. I sold him two and he said he'd be back next week for two more, and that's what really got me started." In those days, Prince let customers butcher the animals in an old corncrib next to his barn. But as more people came to buy goats, the increasing activity -- along with the odd mix of visitors it attracted -- led to complaints. "A government inspector drove up one day and told me I couldn't kill any more goats here," he said. So Prince quit selling his goats, but former customers and others who heard about the "goat man" kept calling. The requests prompted him to get back into business and do it right, building a do-it-yourself slaughterhouse that complied with state health and sanitation standards. "It's interesting learning how people from the different cultures prepare and use all the parts of a goat," said John Hadley, 44, a middle school janitor who lives nearby and is one of five part-time employees who help out at the slaughterhouse on Saturdays. He said many African customers like to eat the heads, while Mexicans often keep the stomach to make soup. Some skin the goat carcasses, while others burn off the hair with a propane torch or over a fire smoldering behind the slaughterhouse. Either way, the customers who come out clearly aren't ready to embrace all of the new ways of their adopted home. "We get a lot of fathers out here teaching their sons things they learned from their fathers and grandfathers," said Hadley. "It's really neat to see all these people keeping their . . . cultural traditions alive."